We were told the 2009 Infiniti FX was revealed last night at a swank cocktail function in Geneva. We were told we'd get to see the range-topping 2009 Infiniti FX50 drop deus ex machina-like from the heavens, ready to solve all our problematic desires for a new luxe Car-UV with a phallic-shaped front end. We were told we could gaze upon the curvaceous site-lines and peek at the 380-plus HP 5.0-liter 32-valve DOHC V8 in the FX50 (or dream about the upcoming 2009 Infiniti EX37 and G37 and their lower-powered V6 with details to be released at a later date under the hood) champagne in one hand and DSLR in the other. We were promised all sorts of candies and horns of ram overflowing with all the goodies and morsels we could ever desire. And we were ashamed that we missed such a splendid-sounding event. Oh, the sorrow. But then we heard the event last night had the crappiest lighting ever and everyone's photos came out looking grainy and over-exposed. Luckily we also received "tips" from marketers from a far away land about a website where all the information we would ever need on the new Infiniti crossover was readily accessed and clear of any shade or gloom of night. And thus, we provide you with the non-grainy pictures above and in the gallery below plus a full press release found below the jump. Fear not lover of live shots, we'll have some of those for you shortly. NASHVILLE, Tenn. (March 4, 2008) - Infiniti today revealed the all-new 2009 Infiniti FX performance luxury crossover SUV in conjunction with the Geneva Motor Show. The second-generation FX, with its fusion of sports car and SUV design, will be offered in three models, including a new 5.0-liter V8-equipped Infiniti FX50. 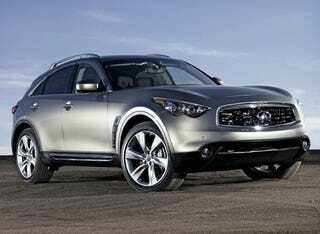 The 2009 FX is scheduled to go on sale at Infiniti dealers in the United States and Canada in June 2008. The new FX's world debut in Geneva was hosted by Nissan Motor Co., Ltd. President and CEO Carlos Ghosn, who also announced details of Infiniti's plans to enter the Western European market in the last quarter of 2008. The all-new second-generation Infiniti FX is designed to offer exceptional levels of power, refinement, safety and driving exhilaration. Created as a fusion of sports car and SUV, with breathtaking styling, sports car-like proportions and an advanced sports sedan platform, the new FX is a showcase of Infiniti's design and technology leadership. Along with its dramatic, aerodynamic body structure and sporty FM (Front Midship) platform, the new FX features a extensive list of available equipment and technology designed to create an exciting and rewarding driving experience - including a new 380+ horsepower 5.0-liter 32-valve DOHC V8 or advanced V6 engine (V6 details to be released later), 7-speed automatic transmission with Adaptive Shift Control and available solid magnesium paddle shifters, available Intelligent All-Wheel Drive, 4-wheel independent double-wishbone suspension and large 4-wheel disc brakes. Also available on the new FX are a Continuous Damping Control (CDC) suspension, Rear-Active Steer, Intelligent Brake Assist and 21-inch aluminum-alloy wheels designed by Enkei. Inside, the new FX interior provides a warm, modern, inviting environment highlighted by a driver-oriented cockpit with available sport seating and available advanced audio, navigation and entertainment systems - including an 11-speaker Bose-developed audio system, Infiniti Intelligent Key, Intelligent Cruise Control (Full Speed Range), Distance Control Assist (DCA) and Around View Monitor system.